If there’s one thing I think the world needs more of, it’s peace. Violence and war is rampant and while it may be easy to put our heads in the sand and feel helpless, I firmly believe we have to be optimistic and strive for a more peaceful world — and the best way to do that is by starting with our youth. Today, I’m thrilled to announce the Points for Peace Campaign, a partnership between TPG and the PeaceJam Foundation, a 501(c)(3) non-profit. PeaceJam is the global leader in peace education that is led by 13 Nobel Peace Prize winners (including the Dalai Lama and Desmond Tutu) who personally work with youth from around the world – giving them the skills and inspiration to bring positive change to their communities. PeaceJam has been nominated for the Nobel Peace Prize eight times and you can see my first-hand experience working with the organization in Ghana in a recent episode of TPGtv. Points for Peace is unique in that you can donate your points and miles and expertise in booking award tickets to help spread peace and develop a new generation of global youth leaders. Your donations will be used toward allowing the Nobel Peace Prize winners and PeaceJam staffers to travel to five countries (East Timor, India, Ghana, Guatemala and South Africa), expanding the organization’s outreach and more, which will directly impact the lives of thousands of youth. Flying to many of these cities where PeaceJam conferences are held can be extremely expensive and, in many cases, out of reach. However, you can’t run a non-profit solely on frequent-flyer mile donations, so TPG is kicking off the campaign with a donation of $150,000 — allowing each of these five countries’ programs to continue to grow and host two-day PeaceJam conferences with Nobel Peace Prize winners. To inspire you, I am also personally matching your cash donation, dollar for dollar, up to $50,000. For readers who want to lend their support, note that the donation is 100% tax-deductible and you can earn points when you give — it’s a great way to help meet a minimum spending requirement! 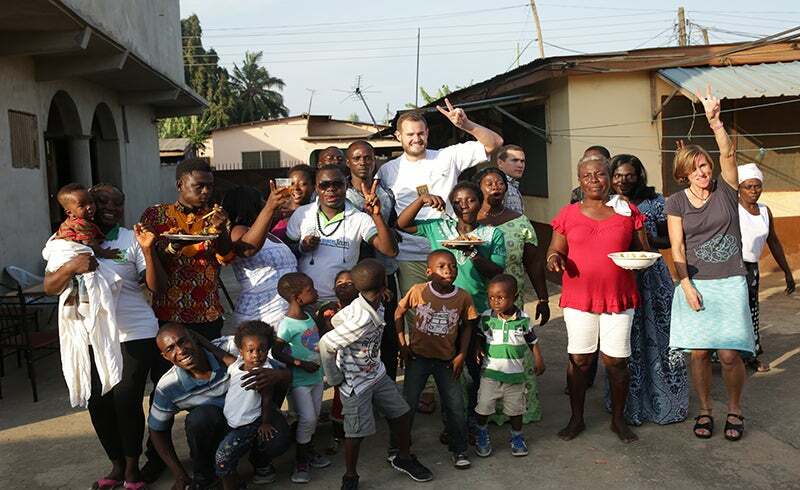 My trip to Ghana with PeaceJam was life-changing. To donate, go to the Points for Peace website. From there, you can select if you want to donate cash, points, miles or advice on how to maximize points and miles — or a combination of the four. Where these donations are going can make all the difference for the future of our youth and our world. I also encourage you to read more about the conferences and some of the inspiring student projects in the conference portion of the site. For individuals, for a $25,000 donation (or total fundraising) to Points for Peace, you and a guest are invited to sponsor one of these conferences where you’ll be able to take part in the local service project and workshops, join PeaceJam staff at the opening and closing ceremonies and explore the city with me, among many other opportunities. Businesses can sponsor a two-day PeaceJam conference for $50,000, which allows four employees to attend, branding throughout and inclusion in TPGtv, as well as four tickets to the Monaco Film & TV conference, where PeaceJam will be premiering a new documentary. Businesses can also provide flights and hotel stays — Starwood provided all of the Starpoints required to accommodate PeaceJam staffers in Guatemala, for example. For more information, email peace@thepointsguy.com for complete details. I will also be taking two lucky readers with me to Guatemala and South Africa, all expenses paid using my own personal stash of miles and points. To be eligible, make a donation of $25 or more and fill out the page after you make your donation to indicate you’d be interested in attending one of the two conferences with me. If you’re selected, I can guarantee you that this will be a trip like no other and the youth will inspire you to make positive changes in your own life and community. This is just the beginning — we are working with travel providers, credit card issuers and other businesses to get involved. If you have connections or would like to introduce us to local business owners in any of these countries, email peace@thepointsguy.com. I look forward to growing this program and hearing your feedback. If you have any questions about the Points for Peace campaign, please don’t hesitate to reach out at peace@thepointsguy.com. For more information on PeaceJam and its local chapters around the world, visit peacejam.org/offices.